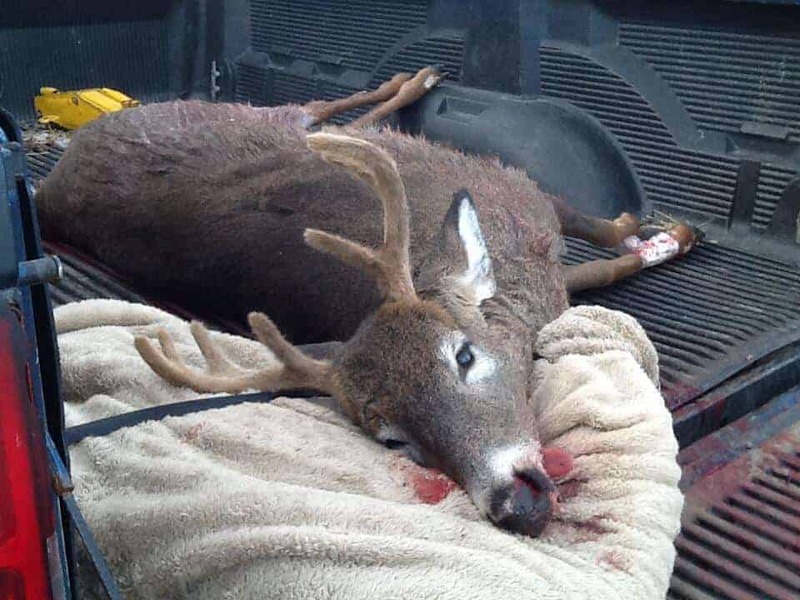 Guest Post by Robert Lowe: A Rare Buck Indeed! - the4pointer.com | Real Hunts. Unreal Stories. 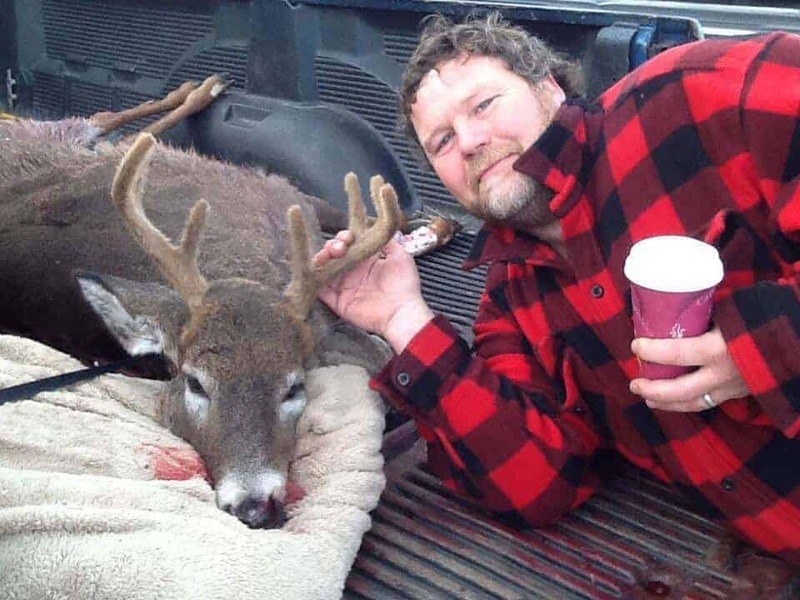 Guest Post by Robert Lowe: A Rare Buck Indeed! This is too cool! 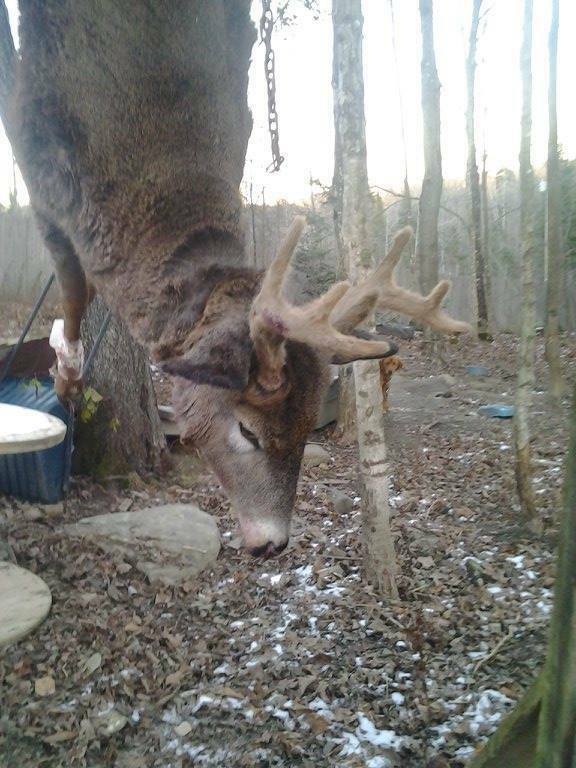 It’s not often that you hear of a rare velvet buck like this being shot in little ole Vermont! Today’s story, by Robert Lowe, is the tale of a season long chase for the velvet buck that finally fell to Roberts bullet on November 20th. After an Archery miss and countless unsuccessful hours spent chasing him by many hunters, Robert finally connected on a day he was just going to pick up his ground blind so he could move it to another location. Sometimes things just come together! On October 19th my brother and I were hunting at my uncle’s farm, and when we went to move a tree stand around, a nice buck jumped up. As he ran off I could see a nice velvet rack. I followed this buck threw the woods at a slow and steady pace for 30 minutes. Eventually he circled back to his original spot. I continued to walk at the slow, steady walk with my bow in hand, and as I slowly walked up to the spot where I had seen him last I was amazed to see him standing on the bank 40 yards away staring at me! I knocked my arrow on my Bow-Tech and set my Sight- Master to 40 yards. I slowly drew back as I continued to walk past this buck not breaking stride. Then, I stopped and slowly turned toward him, kneeled down, picked my spot and released. To my amazement the buck was still standing. I knew I had heard a “thwack!” and he ran off trotting. I checked my shot and found my arrow had hit a 1 inch dry green-colored, dead pine branch that was sticking out. After several attempts by 6 different guys to get the velvet buck with archery, we went into youth deer season and we tried for 2 days to get the kids shots at this buck but he would not cooperate at all. On opening day of the Vermont rifle season there were bucks chasing does in every direction non-stop. There were a few doe sightings on the first three days and a couple smaller bucks shot on another property by others but not us. Then, on November 20th, I decided to go pick up my chair hunting blind at my uncle’s farm and relocate it to another property. I arrived about 9:30 am to the property. It was a chilly 24 degrees out with sun busting out but it still felt cold. I didn’t dress for the weather. I had my light hunting gear on only but was content with it. I headed out with my 7mm-08 CVA Hunter single shot on my shoulder. I decided I would still hunt my way around the property line across from the farm. I poked around really slow in the area looking for any sign of the velvet buck from bow season figuring he must have started rubbing and scraping. I searched the enter property line and trails and never found a scrape or rub anywhere, He had vanished and there were no tracks or anything. I continued still hunting and was closing in on the chair blind I was going to pick up. I slowly worked my way to top of the ridge and an old cattle pasture top. I walked up the tree line about 50 yards and cut out about 100 yards from the blind. As I popped out of the tree line I immediately saw a buck standing there with chocolate horns and he wasn’t more than10 yards from my chair blind! He was quartering away and I immediately dropped to one knee to take the 100 yard shot. I focused only on his body, placed the cross hairs behind his shoulder area and let out my breath and squeezed the trigger. BOOM! My CVA Hunter roared! I watched as the beautiful buck collapsed to the ground. I patiently waited a minute watching to make sure he didn’t run. I had reloaded and started walking toward him. As I closed the distance I started to notice the chocolate horns looked funny. As I got to about 20 yards I noticed that the rack was a complete velvet rack never rubbed off. I immediately check the deer to make sure he was expired and he was and then I rolled him over to make sure he was indeed a buck. He had his proper equipment but his testicles were the size of a pea or small peanut and in a sack about the size of a red milk cap. I immediately returned my eyes to the chocolate rack which was actually a 100 percent covered velvet rack. I careful checked the horns to make sure it was safe to pull him out and it was. I knew his body was big but I didn’t realize just how big. After field dressing and removing four 2 foot long strips of fat about as big as a soda can in thickness, I started the 400 yard drag out of the woods. All the way out I made sure that every rest I would not damage the horns. It wasn’t until I reached the farm where my truck was parked that I noticed how big the deer really was. As I loaded him in truck my cousin commented that he was at least 180lbs. Well, after brief rest for me and story tell to my family I took him to the weigh station He weighed 186lbs dressed complete, and I can only guess if I had left that fat pieces in place he would have been close to 200 lbs dressed out. The rack is not huge but it’s very unique and will be hanging on my wall for years! Robert Lowe poses with his 186 lb 8 pt velvet-racked buck!